← Will Egypt Reach a Consensus? Egypt has always been portrayed in folk history as a woman with eternal youth, defiant and graceful. But the state that has been proud of its iconic past is currently crumbling at a surprisingly fast pace, and no one seems to be able to stop it. The chaotic scenes witnessed in Egypt at the presidential palace on Friday, with rioters attacking the symbol of the state with such ferocity, are unprecedented in our history. These are the result of three factors: the broken barrier of fear from a leaderless revolution, the lack of responsible leadership, and the lack of political stability in light of the current deadlock. A succession of misguided statements from the ruling party, the Muslim Brotherhood, has not helped the situation. The ruling party insists on labeling these youth as “paid thugs” by organized groups with a possible Israeli connection, which reflects only their thinking process, not necessarily the facts on the ground. Thus far, the Brotherhood has failed to link anyone with any foreign plot. Yes, Egypt faces thugs, a legacy of chronic state of poverty, and successive political elites who pay criminals to ruin their opponents’ election campaigns. However, it is crucial to differentiate between the paid thugs and the angry youth who are legions, angry young men, and grade school dropouts. Recruitment of those kids doesn’t take massive, sophisticated organization; small groups are enough to produce chaos with minimum skills. It is important to state that I do not, and neither should anyone else, condone these actions. Any act of violence from any side is unacceptable. Nonetheless, if we really want to stop it, we have to understand the roots and the cause of such a scene. Pointing fingers at opposing parties or forming an Israeli plot are cheap ways to score political points, but they will solve nothing. I doubt that the Muslim Brotherhood would label as thugs those who tried to climb the presidential palace wall, if Mubarak were still in power; in fact, they would probably describe them as the heroes of the revolution. Sadly, this double standard is what has led to the current crisis. Violence has been a recurring theme during the last two years, and the Muslim Brotherhood turned a blind eye when the violence was aimed at the ruling military council, and it never used clichés such as “State’s prestige” at that time. 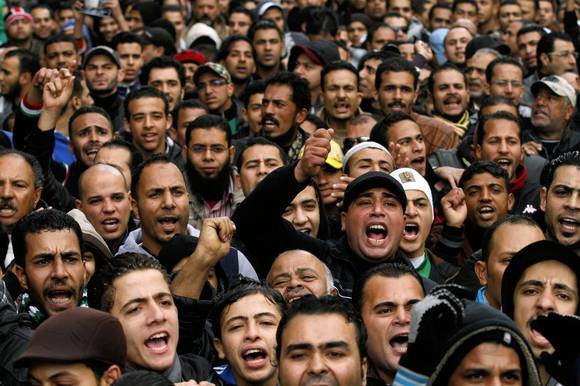 The rise of the angry youth is new game changer in Egypt’s already-murky political stage. It has cast doubt on the potential success of any political deal between the ruling brotherhood and the opposition. The leaderless revolution that many considered a blessing could easily become the leaderless chaos that no one can afford. Egypt is currently a dysfunctional state that is edging toward failure. It is facing the biggest test of its contemporary history, as its elite is losing legitimacy and ability to control. The bridge between weakness and complete failure may take a while, but in a heavily populated country like Egypt, full of unlicensed weapons, a fast decline can easily happen. It’s time for Egypt ruling Islamists and opposition forces to swallow some humble pie, admit mistakes, and stop treating fire with fire, otherwise the lava from the current volcanic eruption will burn what is left of our country. This entry was posted in Egypt and tagged Egypt, Morsi, Morsy, Muslim Brotherhood, Presidential palace, Tahrir. Bookmark the permalink. Thank you giving your balanced asessement of the situation in Egypt. I follow the events from faraway Finland but I pray and hope that your great nation would find a way to a real democracy respecting the human rights of all. Well done. Appreciate the analysis – during my years in Egypt (70’s – 80’s and then in-and-out) these kinds of tactics would, for better or worse, simply not be found. Strong and articulate leadership seems lacking on both ‘sides’. It is me who should thank you for reading. Appreciate your feedback.